Register your student(s) online now! Registration packets for the 2018-2019 school year went home with student(s) on May 2nd. Included in the packet are all the forms required for registration per grade level along with instructions on how to complete the online registration process. Please complete the online portion of registration by Friday, June 1, 2018. However, your registration will not be complete until you have submitted payment and required forms to the District Office by Wednesday, August 1, 2018. For your convenience, a registration drop box is located in the entryway of Prairieview School from May 2 - August 1. More details and all registration forms for returning students can be accessed by clicking here: 2018-19 Current Student Registration. For information on registering a student who is new to the district, click here: 2018-2019 New Student Registration. Reminder: Last Day of School - Early Dismissal The last day of school will be Monday, June 4, 2018. This will be an early dismissal day with Elizabeth Ide and Prairieview dismissing at 11:00 a.m. and Lakeview dismissing at 11:37 a.m. The Board of Education has also approved the District 66 2018-19 School Calendar. The deadline to register for Summer Enrichment has been extended to Sunday, May 13, 2018. To view the brochure of classes that are still available, click here. Follow the link within the brochure to register, or click here to register. A few classes are in jeopardy of being canceled due to low enrollment. Please register now! Center Cass District 66 takes the safety of our students and staff seriously. We have members of our staff who are trained through a CPR/AED Certification Course on a rotating basis every two years. We encourage you to view a video regarding hands-only cardiopulmonary resuscitation and automated external defibrillators by going to the following link: https://youtu.be/Zh_uWrNaVQI. As part of the 20% Project in seventh grade, Gwendolynne Royle wanted to see Lakeview making a bigger impact to help the environment. Over the last year, she researched and completed a grant application with Illinois Clean Energy Community Foundation (ICECF) to have solar panels installed on the south (parking lot) wall of Lakeview. Gwendolynne’s grant application was approved and Lakeview will receive a $6,700 grant to install the solar panels. Gwendolynne will continue her involvement in the project, meeting to discuss installation, and planning an upcoming “Solarbration” when the solar panels will be “officially dedicated” to Center Cass District 66. Catherine Hewawissa learned about a poetry contest in her seventh grade ELA classroom. She entered the contest with her poem “Refugee”. “Refugee” was recently selected as a “High Merit Poem” and published in A Celebration of Poets: Midwest Grades 7-9. Congratulations, Catherine! Order your tickets now to attend Lakeview Jr. High's production of Oklahoma! Performances will be held on Thursday, May 17 and Friday, May 18, 2018. Each night's performance will begin at 7:00 p.m. in the Lakeview Gym. Send your ticket orders to Mrs. Rickert or Mr. Ohlsen at Lakeview Jr. High School. Click here for ticket information. 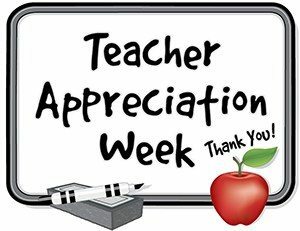 May 7th - May 11th is Teacher Appreciation Week. Thank you to all of our amazing District 66 teachers and staff for your continued dedication to our students! Also, thank you to the PTO and all of the parents and families who donated food, money, and time to show their appreciation this week! Congratulations to Lakeview teacher, Mr. Jacob Little, who was nominated for the Harris History Teacher Award by the Abraham Lincoln Presidential Library and Museum, administrator of the National History Day program in Illinois. The Harris History Teacher of the Year award is sponsored by James F. Harris and is awarded to one middle and high school teacher annually. Each of the 57 National History Day affiliates may nominate one middle and high school teacher for this award. Mr. Little is the middle school nominee from Illinois. The two $5,000 awards are presented to teachers who demonstrate a commitment to engaging students in historical learning through innovative use of primary sources, implementation of active learning strategies to foster historical thinking skills, and participation in the National History Day contest. Dr. James F. Harris sponsors the awards in recognition of the pivotal role teachers play in the lives of students. The two national winners will be announced on #NationalHistoryDay, June 14, 2018. To read the entire press release, click here. Our May 2018 (and final eat out fundraiser of the year!) will take place on Monday, May 14th at 3 Corners Grill and Tap located at 7231 Lemont Rd, Downers Grove, IL 60516. Dine-in or order to-go for lunch or dinner and 15% of the sales that day will be sent back to support the District PTO. Please remember to either print or present the 3 Corners Grill & Tap Flyer. The TEAM 66 Education Foundation would like to express our sincere gratitude to all CCSD66 families and our community for their support at this year's FunDrive with Savers. This was our most successful drive yet and raised $844.67 that will directly benefit our students. Many families and community members inquired about a tax form which is available by clicking here. It's events such as the FunDrive that allow TEAM 66 to fund teacher grants toward superior educational opportunities for all students. Speaking of teacher grants...we are now accepting grant applications from teachers. We encourage you to speak to your students and their teachers about this great opportunity! Can you believe it's already graduation time? This school year has flown by and we are so proud of our soon-to-be graduates. Are you looking for a unique graduation gift that will certainly get their "stamp" of approval and commemorate their time spent at CCSD66 schools? Consider giving your graduate the gift of a personalized brick located in front of the bell at Prairieview. This is an excellent opportunity to create a remembrance of their positive experience at our school district. The bricks will be engraved with their name and graduation year, and are available in 4 x 8 x 2.25 or 8 x 8 x 2.25. Each brick can be custom engraved with 3 lines consisting of 13 characters. A perfect gift from parents, guardians, siblings, and grandparents! Visit www.team66ef.org to place your order today. Bring the entire family out for an afternoon of great music provided by the Center Cass Community Band. Join us on the lawn of the Lakeview Jr. High School campus on Sunday, June 24th at 4 p.m. This "Pops" concert will feature music from "Star Wars", "Mary Poppins", "Pixar", patriotic favorites, and much, much more. There will be food available to purchase. So...grab your lawn chairs, invite your family and friends, and come out and enjoy the Concert on the Lawn! Sen. John F. Curran, Rep. Jim Durkin, and Rep. David S. Olsen's Children's Health & Safety Expo will be held at Lakeview Jr. High School on Saturday, June 2, 2018 from 9:00 a.m. - noon. This community event includes free admission, refreshments, and giveaways. There will be demonstrations from Darien Police K-9, Traveling World of Reptiles Show, and Cierra's School of Dance. Other activities will include touch-a-truck and face painting along with information regarding children's health and safety. To view the flyer click here.